Mark is a mild-mannered microbiologist by trade and surprised everyone by turning out to be a children’s book author. 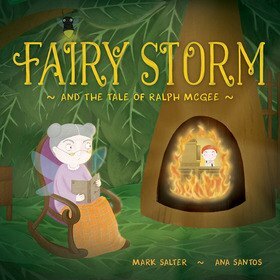 Fairy Storm and the Tale of Ralph McGee is Mark’s first children’s book. His inspiration for the book came from his grandmother and her tales of a small fairy who kept an eye on naughty children. The fairy would dish out a mild form of punishment if the children were behaving badly, which occurred reasonably frequently to Mark and his siblings! It also came from reading many, many books to his daughter and seeing the joy and excitement in her eyes, often followed by ‘Dad, please, just one more?’. Mark grew up in Tasmania and later moved to Canberra to pursue a career in food science. He lives with his partner and two young children. Mark holds a PhD in microbiology and he is a keen reader. He enjoys bike riding, playing guitar and spending time with his family and friends. He wants to resume his passion for sailing when he lives closer to the coast with his family one day. Fairy Storm can be found online at http://www.fairystorm.comand on social media: FairyStorm11 (Facebook and Twitter) and @fairy.storm (Instagram).